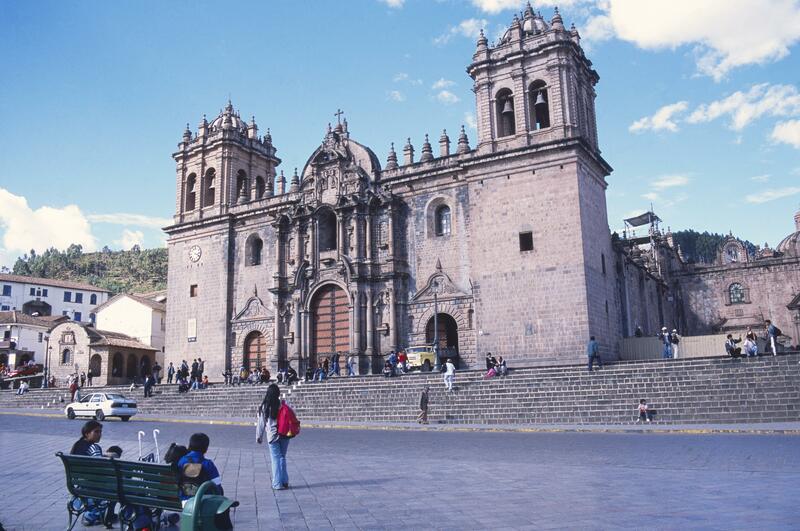 Cuzco’s massive cathedral dominates one side of the city’s main plaza. It occupies a site where the Inka palace of Viracocha once stood. Its builders recycled stone from this and other Inka buildings in its construction. While its architects were Spaniards and Creoles, its masons and carpenters were largely Andeans, many pulled to work on construction projects like this one as part of their service to the state. Wide and squat, Cuzco’s cathedral was built with earthquake resistance in mind. While taller towers were planned, they were reduced in size, adding to the overall horizontality of the building. The elaborate form of the portal was meant to echo interior retables (retablosin Spanish). As in many cathedrals in Spanish America, the façade was one of the last parts of the building to be completed, so reflects mid-17th century tastes. The central portion of the façade is highly decorated, with closely set columns flanking wide openings at center and vertical niches at the side. The niches were originally filled with sculpture. Statues of Saints Peter and Paul flank the stone cross at the very top. The coat of arms of the Spanish royal family appears above the lateral doors, underscoring the connection of church and state. The use of rusticated stone around these side doorways is an idea drawn from Renaissance Europe, but Inka stone masons may have also found the play of light on stone pleasing. The church to the right, abutting the cathedral, was a later construction. The peripatetic Spanish architect Francisco Becerra (1540-1605) created the plans for the cathedral, as he did for the cathedral in Puebla in the late 16th century. But construction took almost a century (as did the Puebla cathedral), during which time the original plans were modified by other architects called onto the project. The stone used in the Cathedral came both from local quarries as well as from dismantled Inka buildings. The Spanish may have conquered the Inka capital of Cuzco, but they left many of its urban features relatively intact. 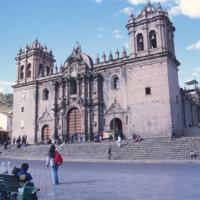 The cathedral sits on a plaza that had been laid out by the Inka, when Cuzco was their capital city in the late 15th and early 16th centuries. In major urban building projects, like the cathedral of Cuzco, 16th-century patrons preferred Spanish architects, who often possessed an expertise and level of training not yet available in the New World. But even though a building’s style was visibly European, it was still a local product. Thus Cuzco’s cathedral was shaped by the local need to protect against seismic instability, the availability of local finances, and indigenous labor and resources. Angles Vargas, Víctor. 1999. La Basílica Catedral del Cusco. Lima: IndustrialGrafica. Cummins, Thomas B.F. 1996. “A Tale of Two Cities: Cuzco, Lima, and the Construction of Colonial Representation.” In Converging Cultures: Art and Identity in Spanish America. D. Fane, ed. Brooklyn, New York: The Brooklyn Museum and Harry Abrams, 157-170.